Gasoline fills our tanks and our conversations these days. People talk about the high price of fuel; the effects of the internal combustion engine on the environment; and, our dependence on the Middle East for our supply. Obviously, these are pressing concerns that everyone should worry about. However, when I pull into a filling station something else concerns me. Gas pumps think humans are stupid. Think about the tank-filling process. 1. The screen provides the following instructions – “CREDIT – INSERT CARD” or “DEBIT – PUSH DEBIT”. 2. The pump asks me a question – “CREDIT OR DEBIT”? Obviously, the pump thinks I am an imbecile. I followed the instructions and inserted the credit card. Are we really as dumb as the gas pump thinks? Do people not follow the instructions? Apparently, that is the case. If people followed instructions, then there should be no follow-up question. 3. After pushing “CREDIT”, the pump tests my intelligence again. It flashes “CAR WASH? -YES”. Conveniently, “OR NO” flashes up separately. This is obviously an attempt by the convenience store to trick me into spending more money. A friend of mine owns a convenience store and explained to me that gasoline does not have a high profit margin. It is used as bait to get us into the store to buy soft drinks, junk food and other high markup items. However, pay-at-the-pump means that many people do not go into the store. How do they make up for the loss? They depend on us being in a hurry and automatically pushing “YES” for a car wash. I am convinced that the gas pumps, or the people who program them, think we are stupid. Statistically, the stores make more money betting we’re stupid. They don’t think, they know. The House doesn’t lose in the long run. It’s a neat trick, just like a casino. seems they are trying to put the “wash” to our wallets. We have the same gas pumps here in Tennessee, but some of ours have another trick. 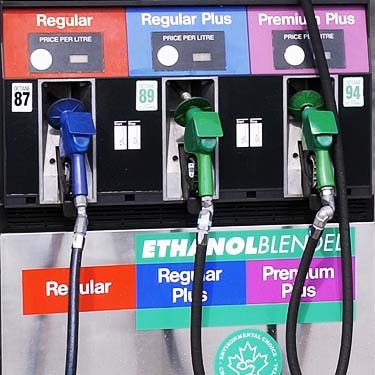 Most of our pumps have grades of gas going from least expensive on the left to most expensive on the right. A few, however, have the order reversed. I wonder how many motorists have been shocked after filling their tank? I haven’t noticed the reverse trick. I will have to be on the lookout for that. Recently, I have started pumping and nothing came out. It seems the tank was empty, and they didn’t put a sign up. Hi! Love your work ….thanks for the smiles today! ! You’re welcome, and thank you for commenting.